The book contains Origamania scheme rather complex origami models. This often animals and insects. The book is suitable for advanced users as well as beginners will be quite difficult to understand diagrams. Complex model origami Pegasus. To perform this requires some skill and experience. For the first time take a rather large piece of paper, it will facilitate the implementation of complex folds. Circuit model may seem daunting, but it is only a first impression. Folds and steps traced in some detail, and should not put you in a difficult position. If you execute this model of high-quality paper, you get a very refined snail, which hit its elegance. Very interesting kusudama assembled from modules ("lips"). This is a fairly complicated model to assemble, but the result is worth the effort. You may find that the model poluchaetsya very flimsy, but half of the links gathered a collection of frequently will gain strength. Success in the assembly, the results unsubscribe in the comments. Volume and fairly complex model origami. from master J.Langa. To see the front of the beauty and sophistication of this Mantis will have to perform 94 steps on the complex, but rather detailed diagram, taken from the popular book Origami Insects II. Enjoy folding. 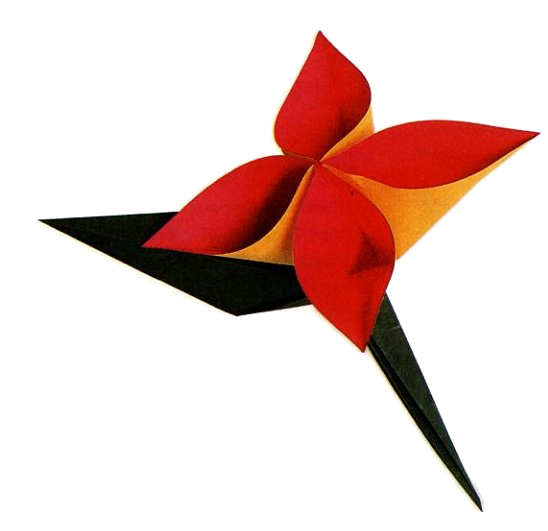 This model came up Minako Ishibashi, which developed its "cabbage" from a very small squares of paper size, such as 4 x 4 cm. Kusudama looks very efektno, if you put lots of colorful models are small, and they fill a vase or box.